Jerome Carayol has a small stand at Lautrec market on Fridays selling garlic, eggs and the odd duck and chicken–his mother supplies the pigeons. 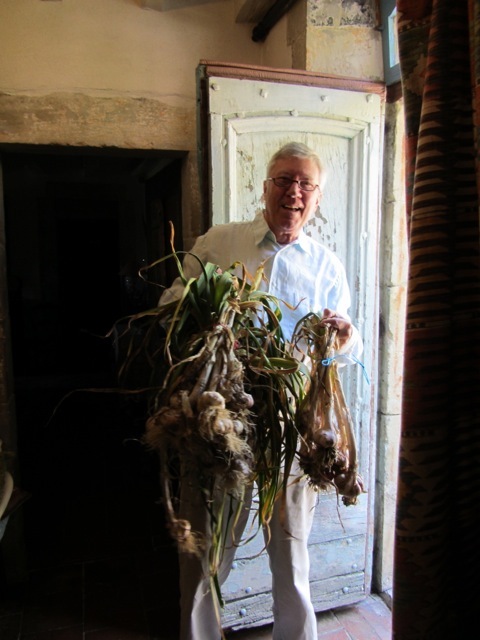 He tells me this morning, picking three garlic bulbs from a small pile as a gift, that he’ll begin lifting his pink garlic (l’ail rose de Lautrec) tomorrow or Monday. 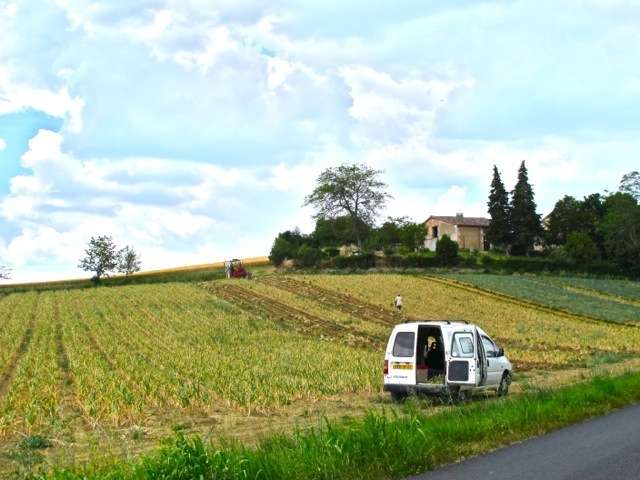 For the last three weeks, starting early before the sun gets a hold, small teams–mainly youngsters–are employed in the fields working slowly along the rows of garlic, picking the scopes (the stem that develop into a flower) off the top of each plant. 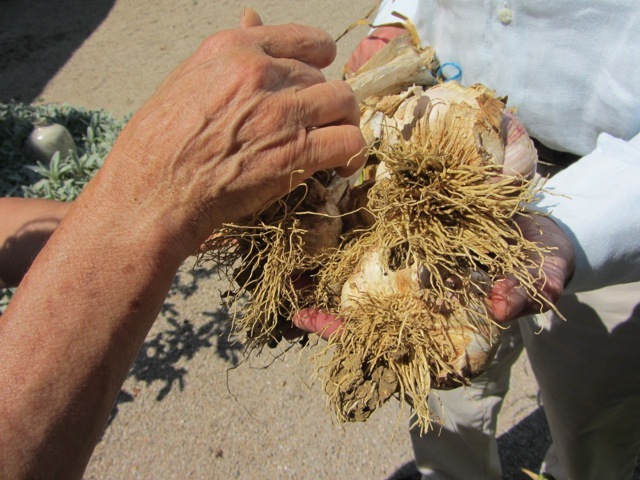 Back-breaking work–but necessary to allow the plant to concentrate its final surge of energy on the bulb. 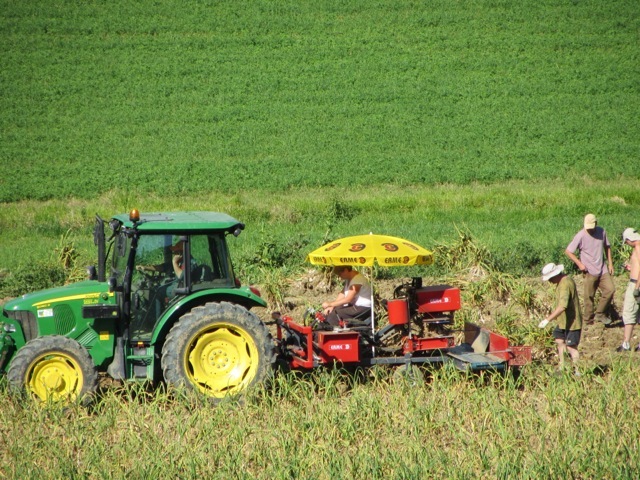 Now the farmers are beginning the harvest. Judy Bach asked for recipes on Facebook. 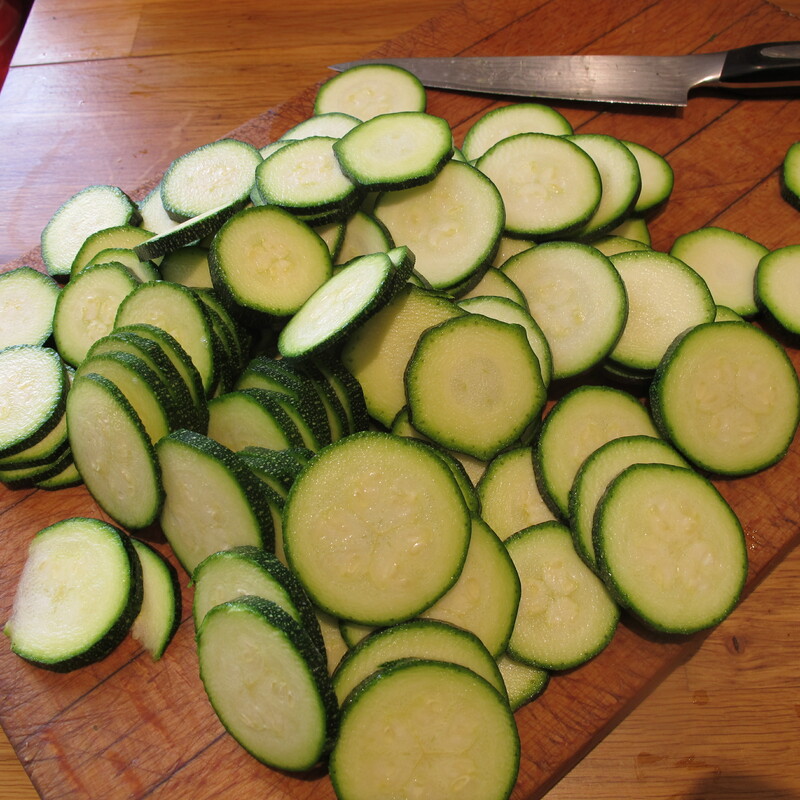 New season courgettes, cooked slow with the new garlic and mint–mushily delicious with a little kick from the chili. 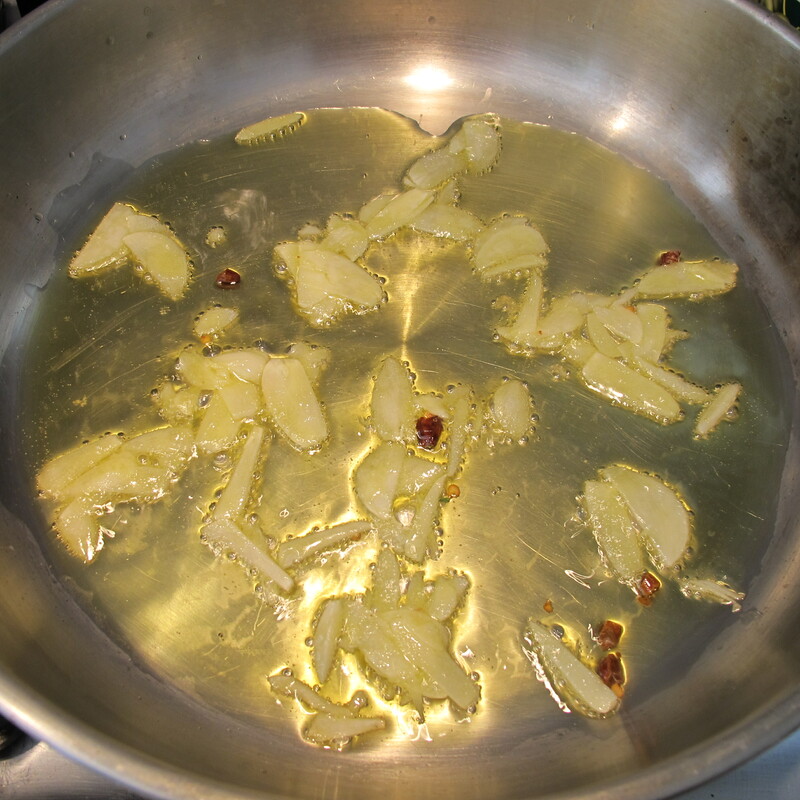 In a medium pan, gently soften the garlic and chili in the oil. 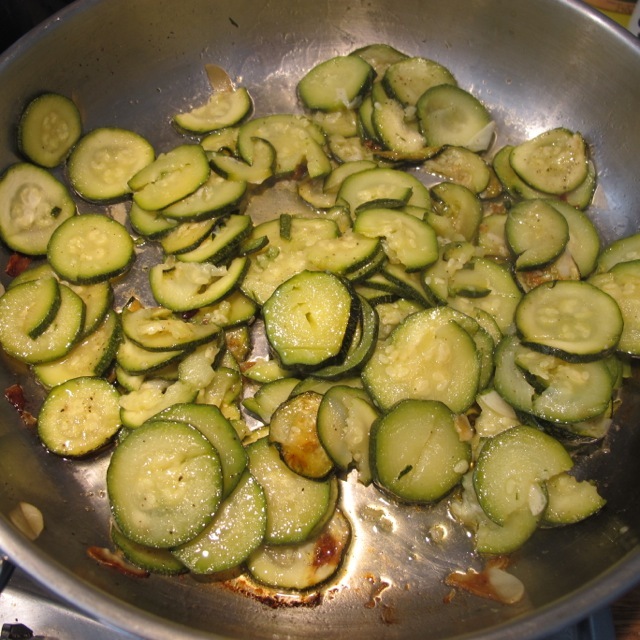 Add the sliced courgettes/zucchini and turn them over in the oil to coat them thoroughly. Turn again to distribute the seasoning. Cover the pan and cook for forty minutes on a very low heat. Uncover and fold in the mint, if you have it–which we have, but I forgot it! Looks better with the mint! It’s that time–again; but three weeks later than normal (due aux mauvais temps [bad weather] in May and June). The question now hanging in the air (with the whiff of garlic! 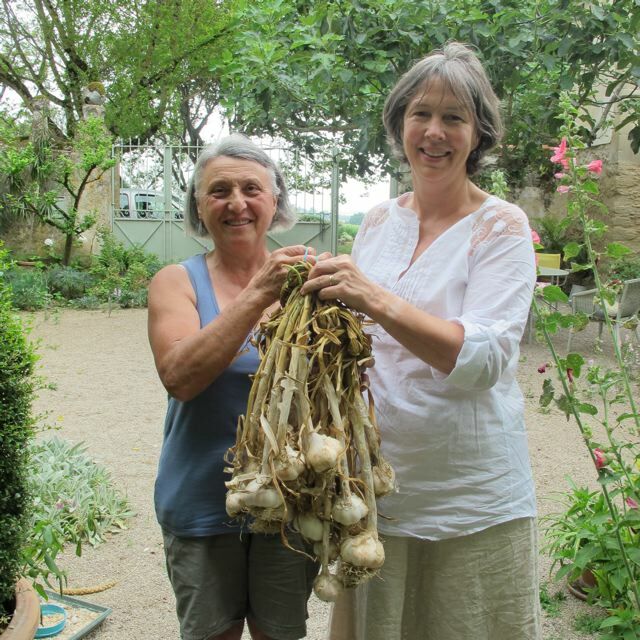 ): will there be enough of the lovely stuff ready for the Garlic Festival–always held in our village on the first Friday of August? She was making light of it though. 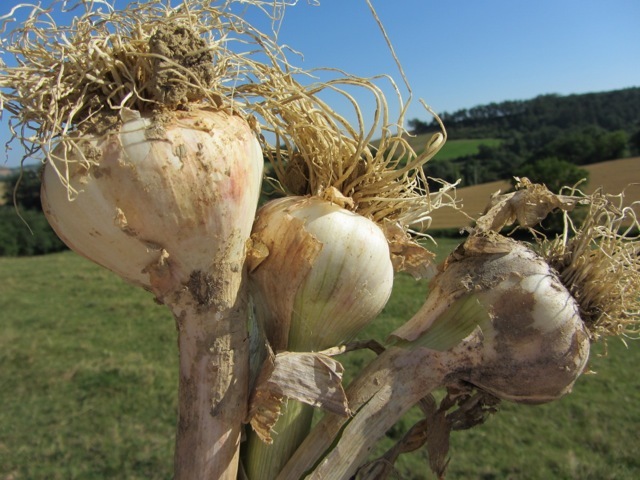 The fields are still unseasonably sodden and the clumps of garlic are coated with earth–adding irksomeness to the lifting and cleaning process. 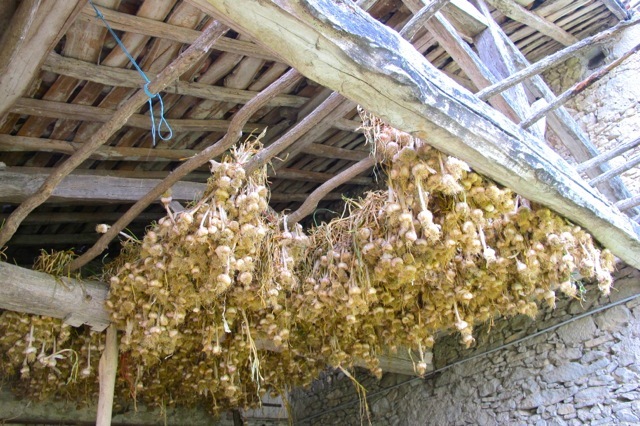 The garlic must spend weeks drying out before being hand cleaned, plaited and sold. This was done in barns open to the heat of summer air passing naturally through them. 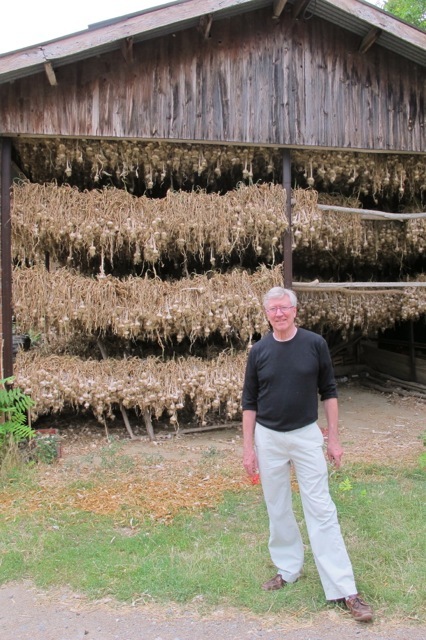 Now with garlic production increased, noisy drying machines–great ventilator fans–are used more and more. 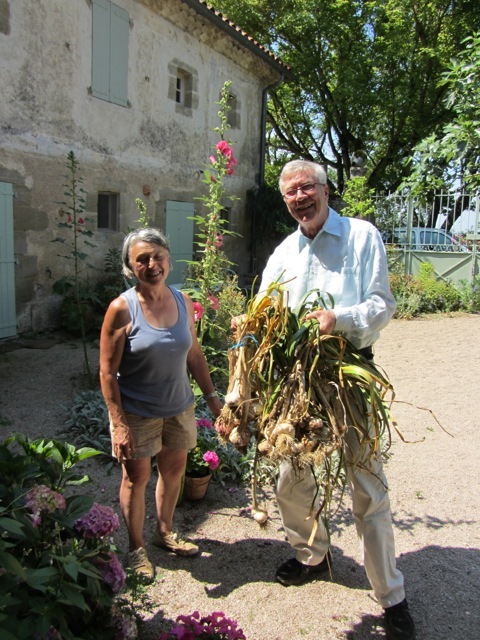 The first year this happened we complained to Pierre-Louis–our young farming neighbor. He came over and agreed that we were in a noise corridor where the sound of his industrial dryer was penible–difficult. He improvised with stacks of hay bales to blanket the racket and we lived with it. He has refined the process and for the next month we are resigned to eating dinner on the terrace to the accompaniment of a low, single-noted wind machine–not a woodwind quartet–that drifts in and out of our consciousness. 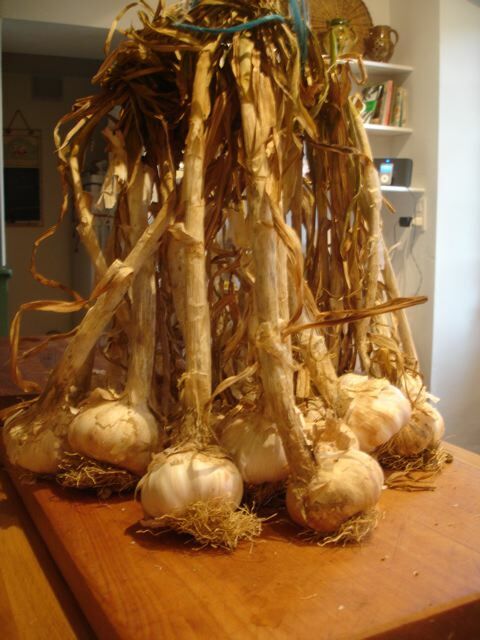 The reports that the Garlic Festival risks being like Hamlet–but without the Prince–are exaggerated, or so we have been reassured. If they’re desperate I’ll offer mine! Sometimes it pays to take a siesta. in our neighbour, Pierre-Louis’ vast new barn–I slept in the cool, behind closed shutters, sheltered from the afternoon heat. When I awoke–Meredith–who got up a little earlier–told me there was a gift waiting downstairs. Alice, our neighbour, who earlier this year was the bearer of much sought after morels–had brought another seasonal gift. I was still half asleep and didn’t immediately twig what it might be. In fact I found myself showing scant interest. Alice had already departed, so there seemed to be no rudeness involved in staying upstairs and wrestling with an idea for a blog post. Eventually thirst got the better of me (not curiosity) and I came downstairs for a glass of cool water. 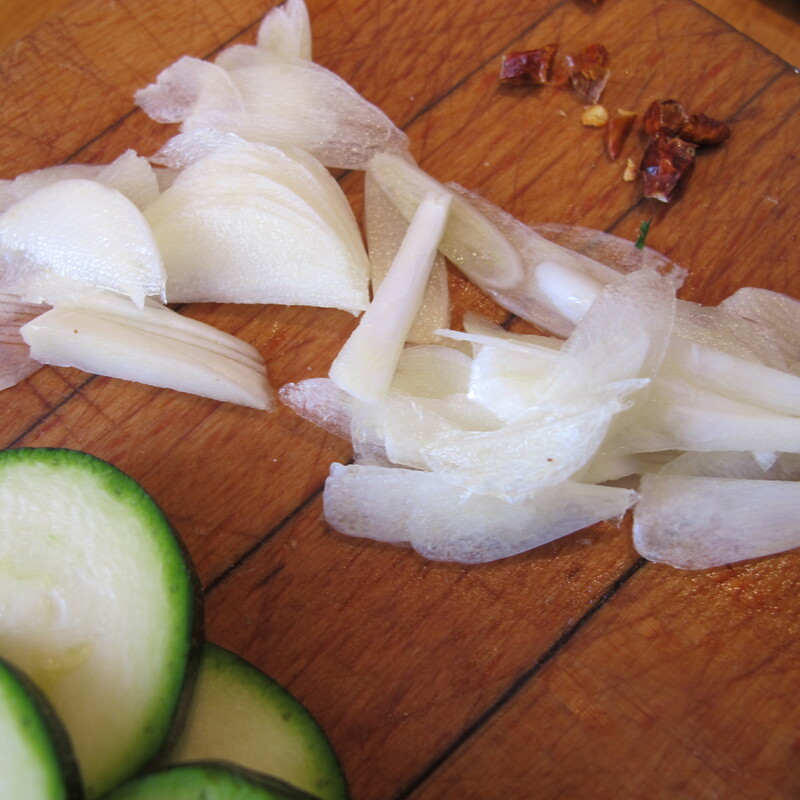 There it was on the counter in all its rough beauty–a stack of new garlic–pulled from the earth a couple of days ago, now offering itself for use in the kitchen. What a thrill for someone who cooks! 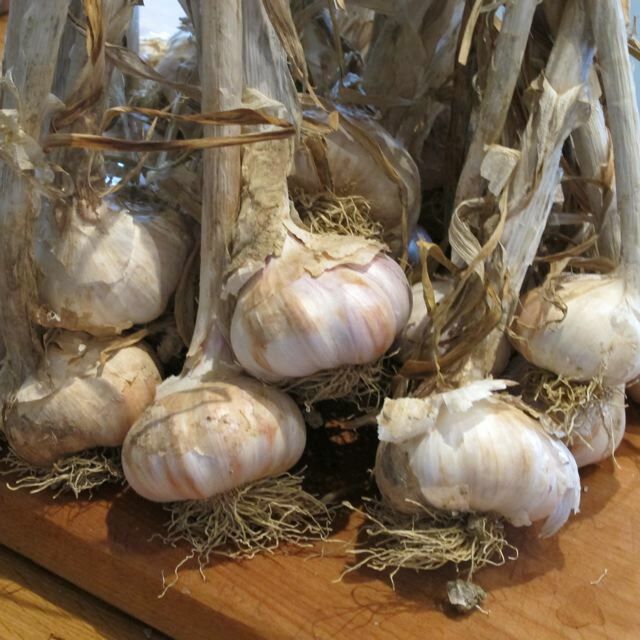 Last week, by one of those lovely serendipities, I came across the site “A Taste of Garlic”. My appetite/interest was whetted–any good Lautrecois’ would be, (L’ail rose [pink garlic] de Lautrec has its own appellation controllée)– by the title, and tickled by the lights-flashing exhaust-puffing 2CV logo. Indeed this extra-ordinary site’s founder and inspiration–Keith Eckstein, a Cornish polymath--is passionate about garlic and a lot else besides: Elvis, football (soccer), Johnny Depp, mushrooms, pigs, Johnny Halliday, IT support and web design, writing, reading and so on. He writes delightful funny pieces and promotes other peoples books and blogs. I contacted him and, belying the laid back “deux chevaux” image, he’s a speedy worker. A few days later he published an interview with me and today he writes a witty and comprehensive review of the blog.